This rural hotel is a building of new construction realized so that saves perfectly the features of the more traditional architecture . For this they have used in their facade elements such as stone and iron , and in the interior details of wood united to a decoration chord a the era you try to capture. is located en the town of San Miguel de Valero, dentro of the province of Salamanca . 9 double rooms , equipped with a double bed or with 2 single beds. 3 Suites muy spacious, equipped with a double bed. A private bathroom inside each room. All rooms son double y exterior, with a large lighting. Each one has its own personality . So much so that all have their own name and que legend is associated with space, even the decoración. Each stay mixes old details with modern elements that ensure the convenience de users. The colorful of the different places, the paintings and the restored furniture make the environments have something special . In addition, in bathrooms can be observed details plant, all in the service of the stories que is expected to tell their walls. The legends speak of leafy forests , of tall castles and of knights that rescued a their ladies . A whole story place where the guests will become a character more than the stories . Even, why not, get to live some of them. también the hotel has a common area which is divided into the reception y 2 living rooms . These spaces are thought for relax , so they have fireplace , a playground, library , and the access to an old staircase that will give the rooms. de outside the back one con garden terrace part of is. This is the perfect place for enjoy del good time , since it also has a private pool for clients. The complex se complete with a restaurant that organizes all kinds of celebrations , such as weddings o communions . They also prepare special menus for the groups as they request it. An opportunity to try the typical gastronomy of the zone made in a unique way and in an enviable environment. This room is intended for host a a single person even though it has a double bed . In this way guarantees all the comfort of people que travel alone for work reasons. It also has its own y bathroom with a decoration that differentiates it from the other rooms in the accommodation. These rooms have capacity to accommodate 2 people , although in all possible add an extra bed. Some have a double bed and others have In addition, all have a private bathroom and a special decoration e individual. are also endowed with a proper name , which invokes a legend o to a story that has to do with the environment where they are located. These rooms are highly recommended for couples looking to enjoy a romantic getaway . Everything inside is thought so that the couple tenga intimacy y a unique environment . They are furnished with a double bed and have a great room bathroom , furnished with a special charm . The amplitude of space and the furniture will be the delights of the guests that are encouraged to spend a few days inside. It is one of the most spacious and romantic spaces that our accommodation has, and where you will be able to rest without space problems. Una living area with television. It is a romantic and luxurious accommodation, where you will be able to rest without problems, and having the best rest options. A large double bed , with sheets and blankets. Inside this bedroom you will feel at home, enjoying a spacious and comfortable resting environment. 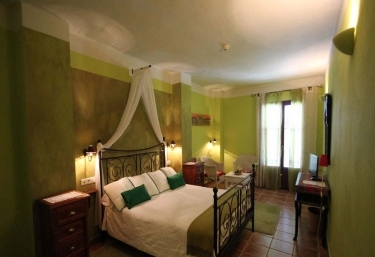 It is another of our double rooms, in which you will be able to rest without problems, and having functional elements. A double bed, that is dressed with nice sheets and blankets. It is a space with all the comforts you can imagine to spend the best possible vacations. It is a bedroom that includes the best comforts, so you feel at home, and you can rest without problems. It is a space with the best options and possibilities for your rest, counting on functional elements. Un pair of single beds s amplia. It is an area of ​​the house with a lot of charm, from which you can enjoy without problems, and with all kinds of comforts. A b full year , equipped with towel sets. It is a room that has all the amenities, and that has a special charm for you to enjoy. A pair of single beds amplia. The hotel se finds in a completely natural enclave , specifically in the middle of the Sierra de las Quilanas , a space declared Biosphere Reserve . In addition, it is located at the limit of the Sierra de Francia and Béjar , so the possibilities to get lost in unforgettable places are endless. These zones offer la possibility of to perform various activities related to the nature . From the hosting provide all the information that the clients need to decide on what to invest their leisure time. Among the activities that can be practiced in the area, highlights the boat rides, balloon rides, paragliding, quad biking, gastronomic routes, horseback riding, hiking, biking routes, or ski when time allows. Similarly, it is possible to make tourist visits to nearby towns and very interesting to see. For example La Alberca, Miranda del Castañar, Monleón, Mogarraz, Candelario or Salamanca.